Creole stuffed bell peppers needless to say I don't make these nearly as often as I'd like to, simply because I absolutely adore stuffed bell peppers and I get carry away eating to many. Is that a good reason? 4 large sweet bell peppers, green, red or yellow ( I like Green ones ). Preheat oven to 350 degrees F. Cut the peppers lengthwise and scrape out seeds and ribs. Bring a large pot of water to boil and drop the pepper halves in allowing to parboil for only 5 minutes. Drain and set aside. In a large skillet, saute the onion in olive oil until tender. Remove the sausage from the casing and add it and the ground beef to the skillet; cook until browned, breaking up into small pieces. Drain well if needed. Add the garlic and cook another minute. Add 1/2 cup of the tomato sauce, reserve the remaining sauce. Cook and stir 5 minutes or until sauce is heated through. Stir in rice, salt, pepper, and Cajun seasoning. Taste and adjust the seasoning as needed. Pour 1/2 cup of water into the bottom of a 9 x 13 inch baking dish and place peppers in the dish. Scoop the beef and rice mixture evenly into each pepper half, topping each off until you use all of the filling. Mix the Rotel tomatoes with the remaining tomato sauce, and spoon evenly over the tops of each pepper and sprinkle each with bread crumbs. 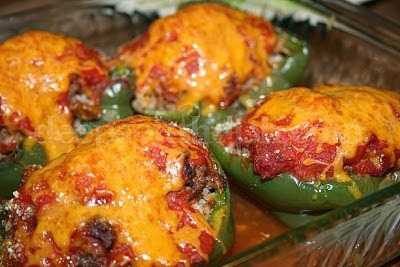 Bake uncovered at 350 degrees F for 30 to 40 minutes, or until peppers are tender and filling is heated through. Remove, add cheese to top, and return to oven until cheese melts.